There are several reasons why you should buy a lightweight suitcase for your travel. The first and foremost reason is the certain weight limit at airports and in transportation. Also, the other benefit is that you don’t have to carry more weight as you travel. But it’s not just about the suitcases being lightweight; it must also be durable, portable and long-lasting. Keeping that in mind, I have created a checklist that you should clear out before buying any of the suitcases. Before you buy any suitcase, you should know that how long that it is going to last. Another thing is that you can’t afford to have a suitcase breakdown while you are on a trip. This will create a chaos and will disturb your routine. There are two types of suitcases that are currently available in the market. One is Soft Shell, and the other is Hard Shell. Personally, I prefer using a hard shell suitcases for my travel. This is especially because it is more resistant to wear and tear than soft shell suitcases. The only problem with the hard shell suitcases is that it gets scratched easily and after long usage, it may get cracked if not taken care of properly. However, this is not a deal breaker for most of the travelers. It is important to select the appropriate size suitcase. This is because there are lots of variants and sizes available in suitcases. You must select a suitcase that got enough space to accommodate all of your items. Also, beware that buying suitcases with the largest available size is not the optimum solution. This is because larger the suitcase, the less portable and heavier it will be. So, I will recommend you to buy a suitcase of a size that you deem can accommodate all of the things that you will need while traveling. Equally, The same things go with the compartments. The suitcase must not be under compartmentalized or over-compartmentalized. It should fit your need. When you are traveling with regular luggage, it is not a problem. But, there come times when you will have to pack more luggage in the suitcases. So, it is better to have a suitcase that is expandable to fit the items. If you are this kind of person, then I would recommend you to buy a suitcase that has a secondary zipper that will expand the suitcase to allow more storage.Let me know what you think about expandable suitcases in the comment section at the end of the article. Let me know, what you think about expandable suitcases in the comment section at the end of the article. Now, this step is optional, but it is good to have some extra features in the suitcase. It may be a fancy zipper, a stylish handle, number of wheels, internal locks, security, water resistance, warranty, color or anything else. Samsonite Winfield 2 is an amazing suitcase whose body is made up of 100% polycarbonate with fabric lining. The suitcase is 20 x 13.5 x 9.5 inches. One of the best features is the side mounted TSA lock which will help you protect your items. It is very stylish, and you can travel elegantly with this suitcase. The zippers are large enough to accommodate any external lock. You will love the inside of the suitcase because as it has organizational pockets, cross straps and a privacy curtain. The suitcase can be further expanded to add more packing capacity. The unified design on the back as well as on the front makes it a pretty good looking suitcase. There are also some other size variants available, but I think this will meet your requirements. Delsey Helium Aero is also made up of 100% polycarbonate and have fabric lining similar to that of the previous suitcase. It has an integrated sleeve where you can easily put up your 15.6-inch laptop along with two mesh pockets to put up any extra accessories. The four wheels make sure that you can easily roll it to anywhere without putting much pressure and weight on your hands. The suitcase can expand up to 2 inches in case you want to pack some more things up. It also has an integrated three-dial TSA lock for security purpose. The elastic buckle and straps inside the suitcase will help in keeping your clothes and items in check. It comes with ten years worldwide limited warranty. It also has another variant which is a soft-shell made up of 100% polyester. But as I mentioned earlier I prefer the hard-shell suitcases. 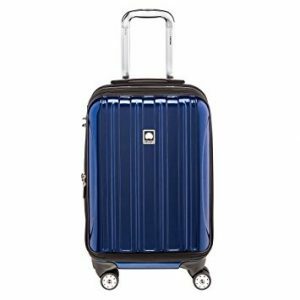 I have covered an entire article on Travelpro Maxlite 4 review, but here I am going to talk only about its Expandable 29 Inch Spinner Suitcase. This is a soft shell or soft case suitcase which is made up of 100% polyester with fabric lining. If you have used Travelpro luggage items previously, then you will know that they use the premium quality material on their product, so you don’t ever have to worry. It is a 360-degree spinner so that you can move it in any direction. Dimensions of the suitcases are 12″ x 20″ x 29″ and weigh approximately 13.8 pounds. You may find it a little bit heavier but always remember it’s a 29-inch suitcase. You might be surprised to know that it has passed 12 various quality assurance tests like fabric abrasion test, temperature test, cold crack drop test and many other. This suitcase comes with Travelpro limited lifetime warranty. Round and round here we come back again to the Samsonite. 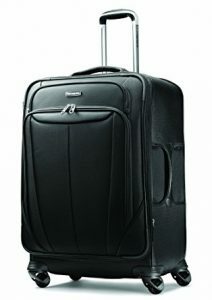 Samsonite Silhouette Sphere Spinner is made up of 100% nylon. 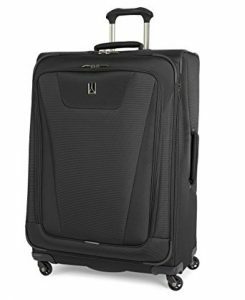 Just like the Travelpro Maxlite 4 it also has four 360 degree spinner wheels, and for the organization, it has WetPak and meshes pockets. The suitcase can be held from both sides using the two provided straps. The corners of the suitcases are textured and protected by the rubberized material to avoid wear and tear. Overall dimensions of the suitcase are 27.25 x 18.0 x 10.5 inches and weigh approximately 10.5lbs. The case can expand for extra packing. The retractable handle makes it easier to carry around and ensure safe passage/travel. Let me know what you think about this suitcase. 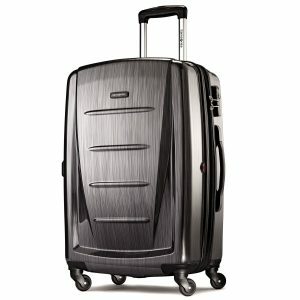 In the recent article Frank reviewed some of the Best Traveler’s Choice luggage, and there he mentioned this suitcase. So, let’s get into the specifics of the bag. 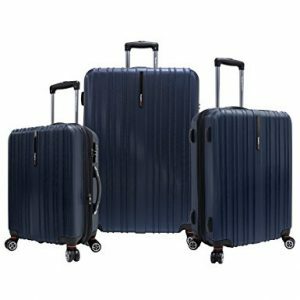 The Tasmania Three-Piece luggage set comes with three suitcase sizes namely 21, 25 and 29 inches. The dual spinner will help you carry it around for traveling comfortably. There are two mesh pockets and one zippered pouch that is attached to the suitcase. There is three dial combination TSA lock for secure packing. Also, there is a strap available so that you can add additional bags. The material used is polycarbonate, and it is very durable, impact resistance and abrasion resistance. There is an expansion gusset available which can expand the bag to 25% of its original capacity. This is the most budget-friendly suitcase that you can find in the market right now. The body of the suitcase is made up of 100% plastic, unlike polycarbonate. The size of the bag is 14.4 x 9.2 x 22.1 inches and weighs 7.6 pounds. Even, it is made up of plastic; the Rockland Melbourne comes with three years of warranty. The ABS plastic is durable enough to resist the normal wear and tear. The suitcase is available in many colors, so you have lots of options to choose from. So, that was all the best lightweight suitcases for travel that I have come across and found interesting. If by chance I have left any of the suitcases that can fit into the list then do let me know using the comment section. I will add it to the list ASAP. Also, if you have used any of the suitcases that I have mentioned here then let me know you think about them.